Swith to another colour but do not break the yarn, you do not want to end up with a lot of loose ends, do you? If you like you can experiment with ilusions. And now I’ll let you knit until your shawl is big enough. Then you might want to add a border – watch this space for some ideas! 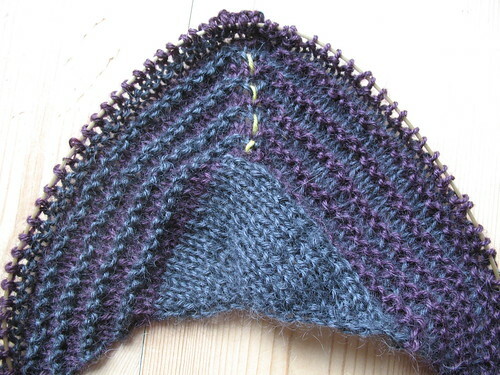 I’m really looking forward to trying this pattern — thanks so much for sharing it. I think there’s a typo in the summary row 3: knit until center stitch, P1 (center stitch), purl rest of the row is included, but that belongs with row 4, yes? @g Thanks for letting me know! I’m looking forward to seeing your Shades of your favourite colours. I’ve got some tweedy yellow laceweight which could look stunning with brown as its shadow. So many exciting projects, so little time!